The Tower Garden comes with directions for starting seeds in daylight. Joe of Level2 Concepts introduced me to a procedure that starts seeds in the dark. I’ve adapted his procedure a bit and have it outlined here. Most plants like a pH of somewhere between 5.5 and 6.5. Rockwool has a natural pH of around 8.0. To give your seeds the best chance of starting, you’ll need to soak the rockwool in water that’s between 5.5 and 6.0. Soak rockwool for 30 minutes or more in water with a pH of between 5.5 and 6.0. Cut the bottom off a 5 gallon ice-cream container or use the bottom of the growing tray that comes in your Tower Garden with the lid removed. (I’ve also used butter containers, etc.) Put masking tape around the outside of the bottom of the ice-cream container and write numbers on the masking tape to coincide with the rockwool cubes. The ice-cream container bottom works well because you can get 10 rockwool cubes around and 4 in the middle. On a piece of paper write down the numbers and the seeds you planted. Shake excess water from each cube, but do not squeeze the cube. 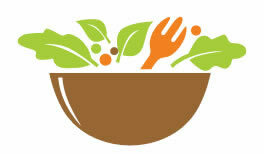 You can also use a salad spinner to shake off the excess water. 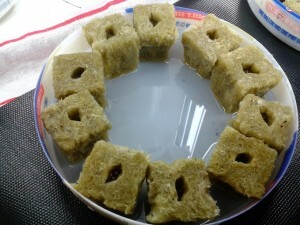 Place rockwool cubes into the bottom of the growing tray or other plastic container. 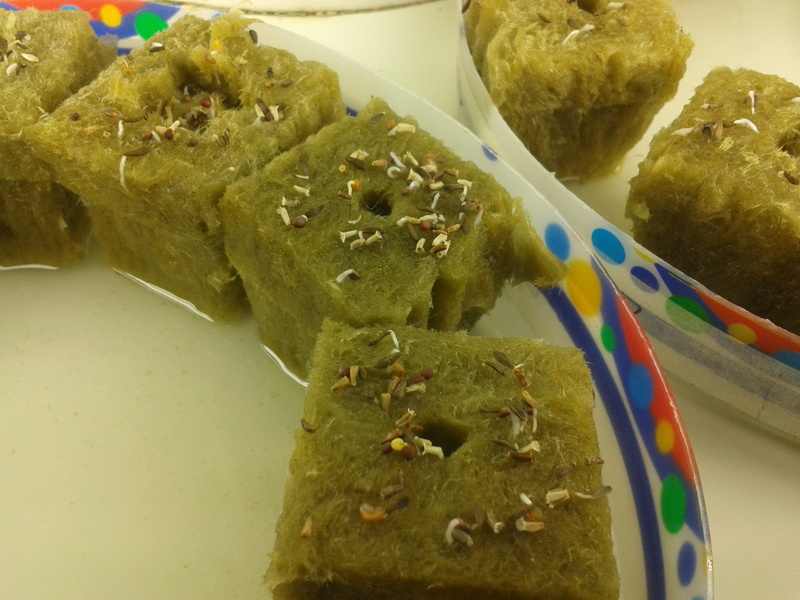 Sprinkle seeds into the hole in the middle of the rockwool. There’s no set rule for how many seeds per rockwool. For arugula, I sprinkle 15 or 20 and don’t thin them. For bibb lettuce, I’ll plant 6 or 8 and only let 1 seedling grow. Generally the smaller the seed the more seeds you should plant. You can always thin the plants with scissors later. Pour about 1/4 inch of pH adjusted water in the container. 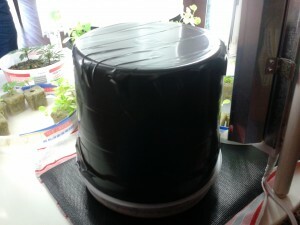 Put black duct tape around the top of the ice-cream bucket and place over the rockwool so the seeds are in the dark. (I’ve also used a box for this.) If your house is cold, you’ll get quicker results if you use a plant starter heat mat. I got mine at Menards, but here’s one on Amazon.com so you get the idea. The top of the ice-cream bucket covered with duct tape. Every day, replace the water with fresh pH adjusted water. Check your seeds every 12 hours or so to see if any have sprouted. 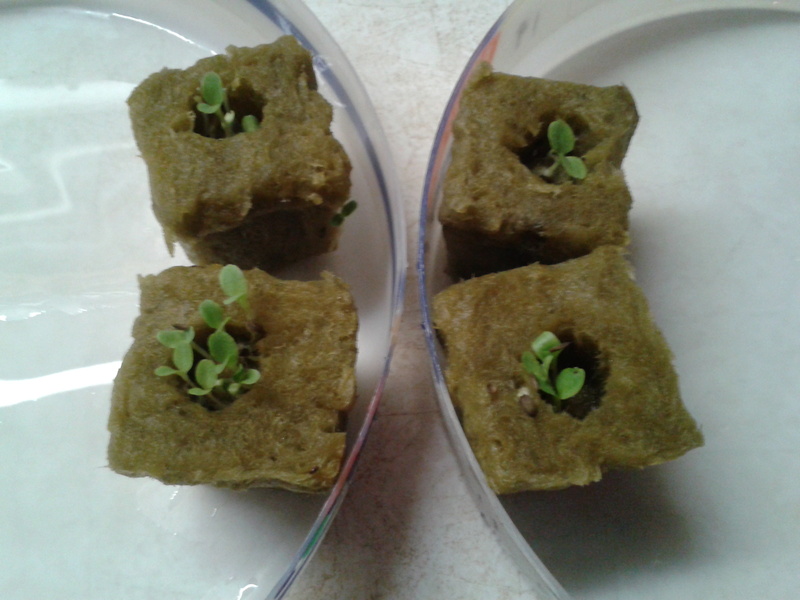 Most lettuce and herb seeds will germinate in 36-48 hours. 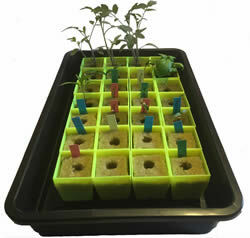 Uncover the seedlings and place them in another container on the base of the Tower Garden with the lights turned on. When you see white fuzz near the seeds, you want to uncover them. This is important. If you wait too long, your seedlings will become leggy. Your goal is to have short plants with large leaves. Arugula seeds that are ready to go under lights. I break a rule here and plant the arugula on top as well as inside the hole. 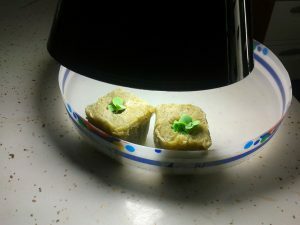 I have a 12″ fixture with a 6500k T-5 bulb that I use for seedlings. This allows me to get the light right close the plants. The closer the seedlings are to the light, the better they’ll grow. I’ve also used a regular desk lamp with a 6500k bulb to get the light as close to the plants as possible. Regular desk lamp with a 6500k bulb. Once a seedling is under the light, you need to drain and replace the water every day. To do this, mix up a container (I use an apple juice container) of half pH adjusted water and half water from your Tower Garden. This will give your seedlings a little nutrient solution. Continue with the above until you see roots starting to exit the rockwool. Once you see roots on the bottom, it’s time to put the seedlings into the Tower Garden. I’ve used this procedure successfully for tomatoes, peppers, various lettuces and herbs. Your mileage may vary depending on the crop and your environment. Adapted from a seed starting procedure by Joe of Level2 Concepts.